HONG KONG: A HK$1 levy may be charged on bottles of beer, wine and spirits to help pay the recycling costs. The scheme is being considered by environment officials and could be put up for public consultation as early as next month. It follows the 50 cent plastic bag levy introduced in 2009. Recyclers welcomed the idea, which could help pay for recycling the 70,000 tonnes of waste glass generated in Hong Kong every year. However, the food and beverage trade said it would be unfair to single out glass, which accounted for only 3 per cent of total waste. Bottled soft drinks or sauce bottles would escape the levy. The money collected would subsidise local glass recyclers, who might be paid according to the volume of glass they treated. Terence Wong Chee-ho, director of Laputa, one of two local factories making bricks with glass waste, welcomed the proposal. “It would help us to recover the transportation costs,” said Wong, whose bricks, made in its Tuen Mun plant, are used mainly by the government. But Michael Glover, chairman of the Hong Kong Food, Drink and Grocery Association, which represents major beer makers and wine importers and has been in talks with officials on the issue for more than two years, said any option considered should “treat people fairly”. “It is not a bottle or a can issue. It is a total waste issue … any system needs to be equitably shared against all users,” he said. Glover also said the levy would not encourage people to separate glass from other waste. A spokesman for listed Dynasty Fine Wines said the company supported the scheme and hoped it could be done in a similar way to the plastic bag levy. It did not think sales would be affected. Keith Wong Wing-kit, a wine dealer, said the levy would have a far greater impact on beer. “Each beer costs about HK$10 and they are more popular than wines. It would add up to lots of money if an importer brings in 100 million bottles a year,” he said. Wong also said it would be highly unlikely that glass beer bottles would be replaced with plastic ones. “Glass is superior as it doesn’t allow light in and it won’t have any reaction with the wine,” he said, adding that some low-end wines might switch to plastic bottles. A spokesman for the Environmental Protection Department said recycling glass bottles was a priority and a consultation paper was being prepared. 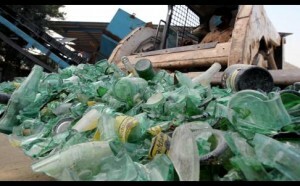 The recycling rate of waste glass containers was just 5 per cent in 2011. Hahn Chu Hon-keung, environmental affairs manager at Friends of the Earth, said the levy should cover all beverages and even plastic bottles to maximise the waste reduction benefits.